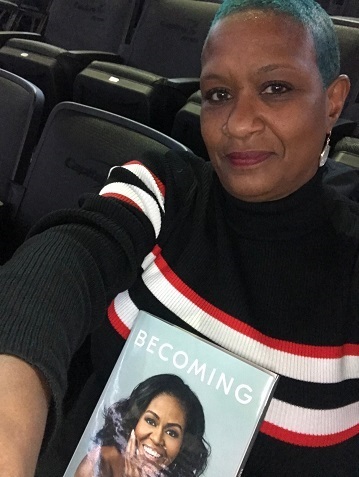 A group of dynamic female leaders at the District of Columbia Housing Authority came together with several community female leaders to attend “An Intimate Conversation with Michelle Obama,” a stop on her “Becoming” book tour. The event with the former First Lady, held November 25th at the Capitol One Arena, was made possible by a donation from First Book, Crown Publishing, and Penguin Random House. Ammett Paige called it “an awesome, inspiring event.” She added that she was honored to be chosen due to her work in the community. “When someone else recognizes your work, you know you aren’t doing it in vain,” she said. 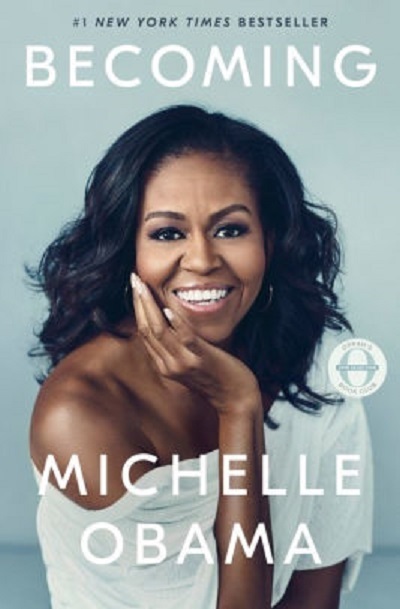 The customers who received a ticket to the event also received a free copy of Michelle Obama’s book Becoming from Executive Director Tyrone Garrett. These customers have various backgrounds including a motivational speaker who once lived at Barry Farm, a creator of a local afterschool tutoring program for a local elementary school, and the founder of a charity that works with mothers who have lost a child due to gun violence, among others. One of DCHA’s customers who attended, Khadijah Long said she was moved to file paperwork for her 501(c)3 to work with women who experienced trauma and children with behavioral issues. Yukia Hugee - Ms. Hugee works with ex-offenders returning back to the community. In addition, shecreated The Farewell Agency where she helps parents who have lost a child due to gun violence. She assists families with burials by working with local churches and funeral homes to reduce final funeral expenses. Aummett Paige - Ms. Paige, the CEO and founder of AMP Outreach Center, focuses her work on underserved families in the Ward 8 Anacostia area. She hosts the Good Hope Family Day each August that feeds at least 400 families providing clothing, back to school items, health screenings, haircuts/braiding, and more. She feeds the homeless for the holidays, hosts a toy and coat drive yearly, and passes out blankets and gloves during the winter months. Additionally, Ms. Paige began an afterschool program at Ketchum Elementary school where she tutors youth and provides an afternoon snack. Ms. Paige also has begun a football league for youth in the Anacostia area. Lonnie Grant - Ms. Grant is a motivational speaker and the author of the book Beauty After Broken. A former resident of Barry Farm, Ms. Grant also is a dancer who teaches ballet, hip-hop, and Zumba to female inner-city youth. Denise Blackson - Resident Council President for the Sibley Townhomes Community, Ms. Blackson is a pillar in her community who advocates for the residents. She gives of her time to ensure the residents are being served. Ms. Blackson has demonstrated an exceptional willingness to coach, advise, and/or guide other officers while exhibiting wise and trusted counsel. Andrenia Walker - Resident Council President of Greenleaf Gardens, Ms. Walker has helped the Council Executive Board create a community plan, identify ways to be successful in implementing the plan, and has ongoing projects and services that clearly show how to fulfill the community vision. Rhonda Johnson - Ms. Johnson is an entrepreneur who started her own business named Memoirs of 2165 Inc. Ms. Johnson has authored two books and acts as an advocate for individuals who confront drug abuse, homelessness, or mental health challenges. Ms. Johnson has received honors for her advocacy work and was featured in a Fox 5 News report, as well. She is a sought after a panelist during Mental Health Awareness events. Rylinda Rhodes - Ms. Rhodes is a community advocate and activist fighting against workplace sexual harassment. She started a leadership group in her Ward 8 community which works tirelessly to inform D.C. residents of their rights in the workplace against unwanted advances and the steps needed to report sexual harassment on the job. Ms. Rhodes is a recipient of the Wayfinder Foundation Grant for Minority women which allows her to continue her passion and commitment to creating safe work environments for women. Khadijah Long - While helping her daughter get through pharmacy technician school and supporting her son during his senior year of high school, Ms. Long decided that she, too, would return to school. Ms. Long decided to pursue a Ph.D. in Psychology. Ms. Long became a Licensed Professional Counselor (LPC) in 2018. Currently, Ms. Long is working as an Expressive Therapist and Adjunct Professor for UDC working in their Psychiatric Institute Department (PIW). She plans to complete her Ph.D. in 2020. Sharon Coffey - Ms. Coffey is a homeowner and graduate of the D.C. Housing Authority’s Family Self-Sufficiency Program. She works with youth in her Henson Ridge community; teaching youth how to use dance as an outlet to keep them off of the streets. Ms. Coffey also partners with various service providers to target youth in Ward 8.